The conventional vegetable garden was laid out in rows, with no permanent paths but enough space to walk between each row to harvest the crops. At the end of the year the whole would be dug over. However, many gardeners, particularly organic gardeners, use a narrow bed system and this has lots of advantages. Narrow beds work well because compost and manure can be concentrated where it is needed, crops can be closely spaced and weeds shaded out, soil structure is never compacted and weeding is easier. In addition, the ground can be worked even in wet conditions, the raising of beds improves drainage, and the separation and rotation of crops becomes much easier. 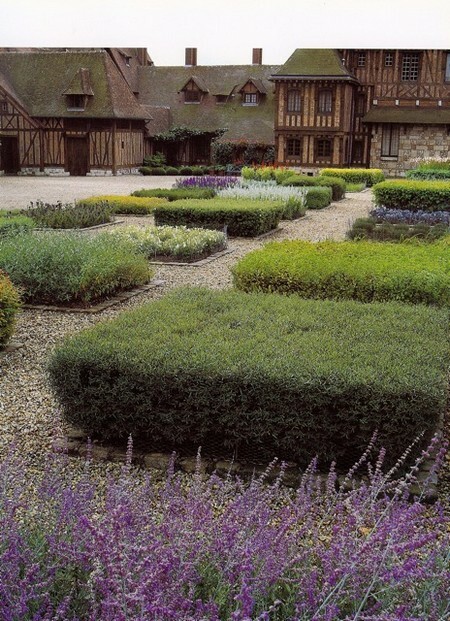 The beds are approximately 1 metre wide with paths perhaps 30 inches wide. Once the initial ground preparation has been done the topsoil is spaded up from the paths onto beds. Being raised above the path level, excessive rain will drain off and the ground will be workable even in wet weather. The beds can be edged with boards that look tidy and retain the soil, but can harbour slugs and might be expensive over a large area. Or the beds can be given a curved profile by spading up the soil. This is good for drainage, and makes it easier to keep the edges weed free, though the birds can more easily drag compost off and, in heavy rain, soil can be washed off.